It's that déjà vu feeling all over again.. the Motorola A630 has more than a touch of the Motorola MPx and Motorola Accompli 009 about it, yet it is clearly a more elegant phone than either of them. Competing perhaps a little with the PalmOne Treo 600 and Blackberry 7230, the Motorola A630 is a tiny communicator style device with a 176x220 pixel display, full QWERTY keyboard, Bluetooth, a VGA resolution digital camera. Size and weight are to be confirmed, but we believe that the A630 is about 100x53x23mm and 105 grams. 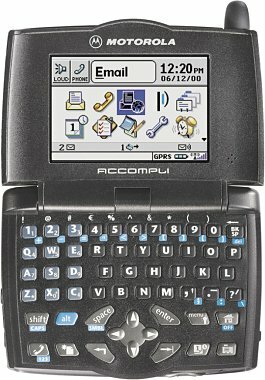 The improvements over the Accompli are vast, with a simpler and easier to use keyboard, better screen, Bluetooth and much more, and really the only thing to rival the A630 in terms of specification is the Motorola MPx. However, get past the radical looks, landscape format screen and clever keyboard, and the A630 does look a tiny bit mundane. After all, we've seen tri-band GSM phones with VGA camera, Bluetooth and and 176x220 pixel displays before, and although the A630 does a decent job of combining all these features, it's hardly groundbreaking.. if, as we say, you ignore the looks, screen and keyboard which are kind of important. The A630 also packs MP3 support, two way paging and instant messaging, Java for games and other applications, MMS, integrated handsfree, personal information management (PIM) functions and all the other features you'd expect from a Bluetooth handset. There's a web browser in the A630 too, but the screen isn't large enough to use as a proper web surfing phone. Perhaps the great strength with the A630 is the sensible feature set combined with the clever but not too-clever design. It's only about half the weight of the upcoming Nokia 9500, is unencumbered by Windows and it looks good too. We rather like the A630 and perhaps we'll put it on our wish list for Christmas. 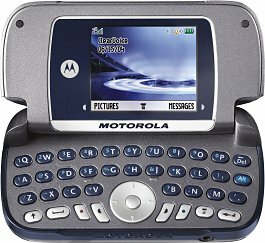 Motorola say that the A630 will be available in the third quarter of 2004.